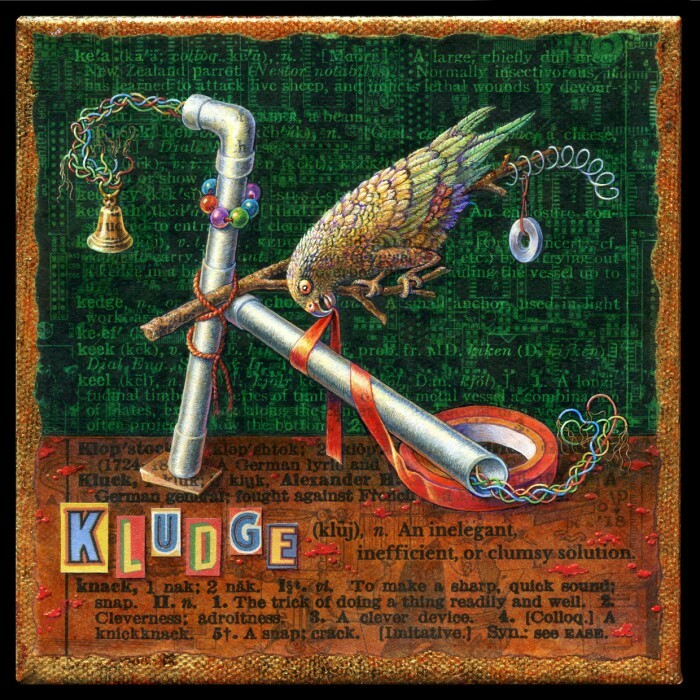 Wednesday’s word, “kludge,” was new to me when Anu offered it, but I took to it right away. It seems so onomatopoetic, somehow, & so useful to describe the mess that results when you just have to grab whatever is at hand & do the best you can. Despite my fondness for the word I ran into trouble immediately– it’s quite a modern coinage, so none of my antique dictionaries included it. In true kludge fashion I’d be forced to wrangle it in somehow. I decided to do it inelegantly, à la ransom note, with letters sourced from old circus posters. The definition I snagged shamelessly from Anu’s email. Now, how to illustrate it? My mind went first to circuit boards, then to Rube Goldberg machines. (And both of those sidetracks remain faintly visible, like palimpsests, in the background.) But I wanted something alive in there. That’s when being bird-brained came in handy! I was thinking about crows & how they are able to improvise tools, so I started researching “bird intelligence.” And there, like a gift from the Kludge gods, arose the magnificent kea. Not only is it reputed to be the most intelligent bird on earth, it’s quite a handsome creature, & the only bird thought to exhibit contagious laughter. What’s not to love? It even has the consideration to begin with K! Moreover, its penchant for creative mischief has driven the humans who have invaded its territory to kludge a device to distract it from meddling with everything man-made in the vicinity, including traffic cones. Thus was born the kea gym, a variation of which forms the letter “K” in this curiotype. I’m not sure where all the red paint splatters came from… it’s not like my studio floor looks like that or anything. Ahem. Anyway, as I was about to say, Kludge turned out to be the most troublesome, yet the most fun of all this week’s words. And of course you can find the painting & prints in my Etsy shop! This entry was posted in A Word A Day Illustrations, Paintings, Prints Available, Uncategorized and tagged A Word A Day, Acrylic, Art, AWAD 2018, Bird, Curiotype, Funny, Improvised, Kea, Kludge, Leah Palmer Preiss, Letter K, Parrot, Parrot gym on 5December 2018 by Leah.